BOSTON, MA -- Another week has come to a close in the Eastern Hockey League Premier (EHLP), as we are getting closer and closer to the postseason. This past week featured 12 out of the 13 EHLP teams in action, which brought with it plenty of worthy candidates for our weekly honors. 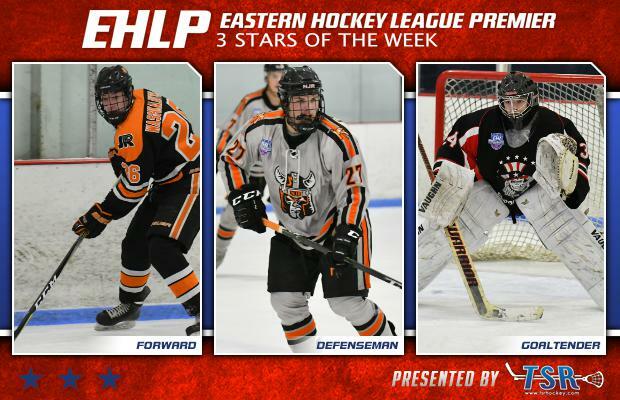 The EHLP is pleased to announce that Kyle Washkalavitch (Philadelphia Jr. Flyers), Brandon Kwestel (New Jersey Renegades), and Anthony Shrum (Philadelphia Revolution) have been named the TSR Hockey Stars of the Week. This upcoming week includes the final 14 games of the regular season from Tuesday to Sunday. The next and final set of TSR Hockey Stars of the Week will be released on Monday, March 5th at 10:00am. Catch the EHLP action all season long on HockeyTV. Washkalavitch and the Jr. Flyers won all three of their games this past weekend with the forward leading the way on Friday with a hat-trick against the Central Penn Panthers. The 2000 followed things up with a pair of assists in his team's win over the New Jersey 87s on Saturday, along with a goal against the Philadelphia Little Flyers on Sunday. The native of the Thornton, PA now has 20 goals and 25 assists for the season (45 points) in 40 games. The Jr. Flyers will wrap-up their regular season this upcoming weekend with a pair of games on the road against the Philadelphia Revolution. Kwestel and the Renegades won their final two games of the regular season this past weekend against the Central Penn Panthers. The 2000 had a goal and four assists in the win on Saturday, followed by a pair of assists on Sunday as well. The New Jersey native, now has an even 20 points on the season. The Renegades will now get some time to prepare for their First Round playoff matchup with the Philadelphia Little Flyers, as they await to find out who is hosting the series. The Revolution went 2-1-0 this past week with Shrum between the pipes for their 2-1 shootout win on Saturday against the 1st place Boston Jr. Rangers. The '99 had a .975 save percentage for the game, stoping 39 out of 40 possible shots, and won in the shootout. The Michigan native is now 7-3-0 on the season with an impressive 2.67 GAA. The Revolution will conclude their season this upcoming weekend with a game against the Philadelphia Little Flyers on Thursday, followed by a pair of games against the Philadelphia Jr. Flyers. The EHLP would also like to recognize a pair of honorable mentions this week starting with Tyler Allen of the New Jersey Renegades. The forward collected 3 goals and 5 assists (8 points) in his team's two wins against the Central Penn Panthers. 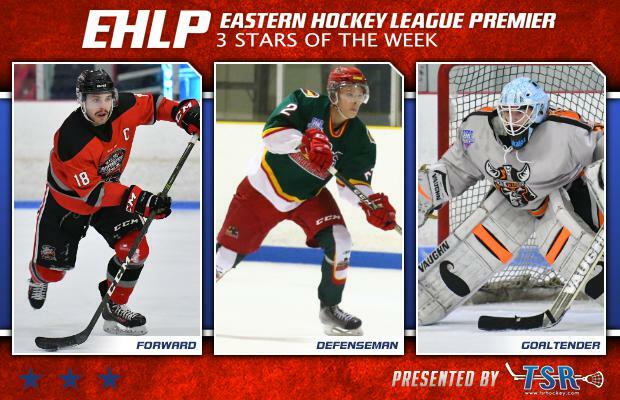 The Russian native, Egor Borschev put together a solid weekend for the Walpole Express by collecting four points over two games this past weekend against the Vermont Lumberjacks.